Parking Lot Manager is a management and security tool for monitoring vehicles in a parking lot, on a neighborhood street, or anywhere it’s important to know the identity of the vehicles and whether they are authorized to be there. This app was created for managers of private parking areas at apartments, condos, or commercial buildings and for neighborhood watch organizations. It’s a fast and easy way to keep track of a collection of vehicles. 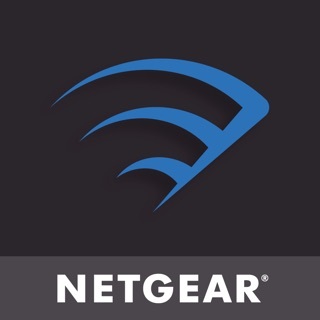 Fleet managers may also find Parking Lot Manager to be a valuable tool. 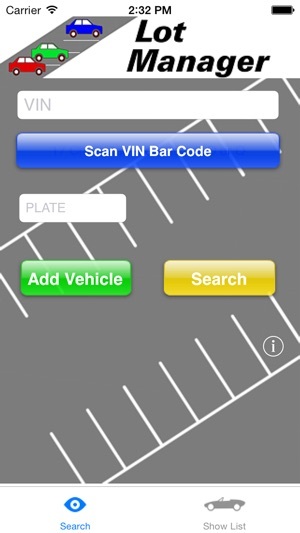 The user can scan the VIN barcode or enter the license plate number or VIN using the keypad. If the search button is tapped, the software will identify if the vehicle has been previously entered. The vehicle information can then be displayed. Tap Add Vehicle and a new record will be created. Vehicle information can be entered manually when the VIN and barcode are unavailable. If the VIN is scanned or entered, Parking Lot Manager will automatically identify the Year, Make, Model and Trim for the newly discovered vehicle. Additional information can be added such as color, plate number, parking space number and a detailed note. A photo of the car and/or license plate (or the car’s owner) can be added. A one-touch in/out time stamp is available to track arrival and departure times if desired. The list of vehicles is displayed in a table with thumbnail photos and can be sorted by plate number, car make, or parking space identifier for quick review. 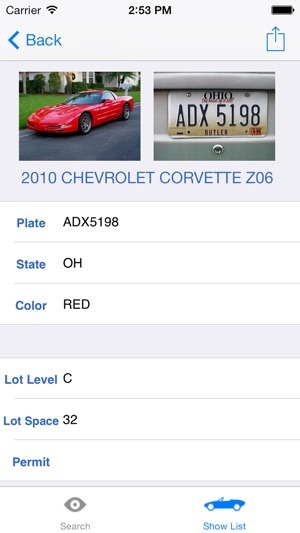 A vehicle’s complete record can be displayed and edited by tapping on any entry on the list. The VIN barcode scanner requires a device with an auto-focus camera. The automatic VIN identification function includes data for North American cars and light trucks having 17-digit VIN numbers (1984 and later). the record keeping portion is useful. Thankfully I am able to save a photo of the plate which helps. Tried 6 different cars and none would scan. The onscreen tip was: "Try to eliminate glare." On a windshield? Outside? Seriously? To even get close enough, you have to lean on the violator's dirty car, fiddle around to line up the VIN, and wait... And wait, and wait. 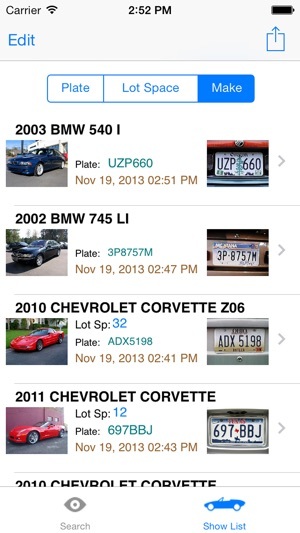 The record keeping function IS worth 3 stars, and you can store pics (of the car and plate). Some better features would be nice: like a field for "warned/ticketed/towed" and the ability to import a list (exporting a csv file is handy). DON'T buy for the scanner, the data log is marginally useful, though. Pros: You can store all info of the vehicle nicely. Cons: It can only scan bar code of the vin. I wish it can scan vin with no bar code. Lots of cars now don't have bar codes on their vin. iTunes have the way of you just scan the number from the iTunes card from your phone and it automatically inputs all the numbers for you. It would be nice if this app can do the same! Please update!!! For now this app is only worth $.99 for me for what it can do. But I payed $1.99 just to test it out! Sigh!! !